Do you want to be a part of a HYIP which are running from more than 2 years? Aurum Bank was started on 30th Of April 2015 and still running without any scandals. When we talk about an old program then the first question come to our mind that how long it will run more. Fortunately, this question has resolved more than 2 times already. First time on 7th Of December 2016 when it was started it's first big promotional activities over the HYIP industry. Second time on 1st Of March 2017 and finally before 45 - 50 days ago when it has started their biggest promotional activities. 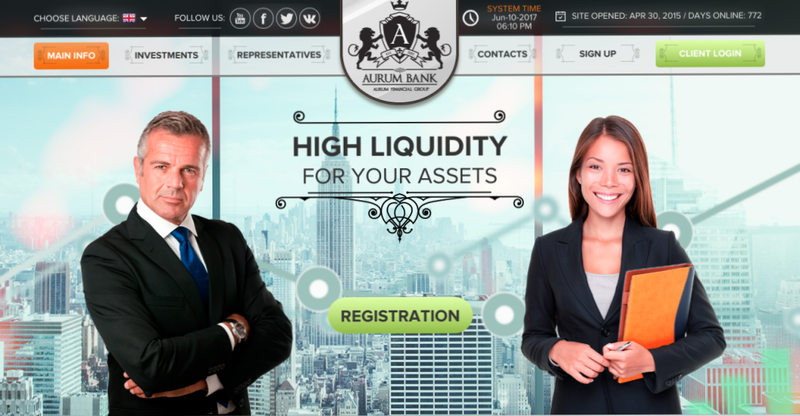 By the way, Aurum Bank was added to AlexNews on 2nd Of June 2017 and $200 were re-invested back into their program for monitoring purpose. According to the allhyipmonitors it's one of the most searched program at their site and their threads on forums are the most viewed thread in HYIP category. These information are enough to tell about the popularity of Aurum Bank. This program was started with the default GC HYIP manager template, I don't remember the exact time when they've added the new design to their website but the current design is very impressive and classy. As I said it was started as a very simple program but right now it's one of the most big budget HYIPs. The admin has spent step by step and filled every requirement which was needed for a grand HYIP. Their website is fully compact, they have their own youtube channel with lot of video testimonial and they're very active on social media also. For communication, they have 24/7 active live chat support and working phone number also. Aurum Bank was started with a flat investment plan - 0.8% daily for 260 business days but they've added more attractive plans later. Right now there are too many plans, but main plans are 0.8% daily for 260 business days and 1.1% daily for 110 business days. Principal will be back at the end of the term. Other plans are disappointing. 3% to 8% daily for 20 to 110 business days but the daily profits (and principal) can't be withdrawn before end of the term! I've never seen such a plan where daily profits can't be withdrawn on daily paying plans. To be honest, 0.8% daily for 260 business days are too long in comparison of modern HYIP's plans. But keep in mind that this was the key plan of Aurum Bank and they're running from more than 2 years with this plan. 1.1% daily for 110 business days will provide less profit but still looks more attractive than 0.8% daily. Unfortunately, minimum investment is started from $350 in this plan. Technical specifications of Aurum Bank are first class. Their website is hosted on DDoS guard which also provide very strong DDoS protection. Licensed GC script for known member area and optimum security. Extended validate SSL for the most secure connection. Finally, I want to give a special thanks to the admin of Aurum Bank. These programs are like the backbone of HYIP industry. I appreciate their dedication about the program, running a HYIP for more than 2 years was never an easy work to do. Still, this program will not live forever and will be stopped on any given day. So, please don't invest more than you afford to lose.